The king of Zimbabwe is choosing a new wife. Mufaro sends his two beautiful daughters to be considered. The main difference between the daughters is that one has a kind temperment and the other has a bad temper. 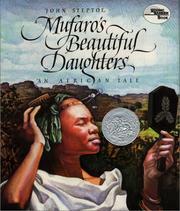 Steptoe, John, “Mufaro's beautiful daughters: An african tale,” Children's Picture Book Database at Miami University, accessed April 23, 2019, https://dlp.lib.miamioh.edu/picturebook/items/show/11284.